In December, we’re activating the time circuits, charging our flux capacitors with 1.21 Jigawatts (what the hell is a Jigawatt?) and slamming the accelerator to hit 88MPH! You’re gonna see some serious sh!t. 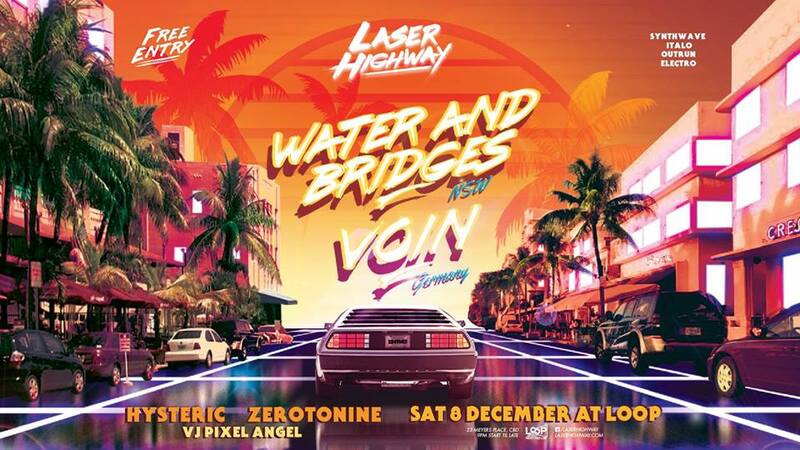 We promise a night of pure adrenaline-fueled synthscapes for you to dance and play as we outrun the sun. Laser Highway’s Summer of Synth has begun! catalyst and motivation needed to dive deeper into the creation of original music. Andrew began to expand his sound and worked in tandem on an album-length release of this newer material. ‘Tales From The City’, W&B’s debut album, released on December 27th 2017. Tracks from this release quickly began appearing on Spotify retrowave playlists and review sites across the web, garnering positive feedback for it’s traditionally retro sound and themes. Since this release, W&B has taken a year to write, produce and refine his sophomore record, ‘Starbound’, which is due to be released in late 2018. The first single from this record, ‘Battlestations!’, a synth-rock tribute to the masterworks of Journey and Stan Bush, has received airplay on The Faction and Artefaktor radio, a feature of Neon Nights, and held the #1 ranking on the Triple J Unearthed metal charts for three consecutive weeks. Bi Nuu, Cookies with additional shows around Europe for Laroboterie Italy, Spellbound & Dark Allies Amsterdam, Kaiku in Helsinki and is currently the resident DJ at Worm nightclub in Rotterdam, Netherlands plus Leipzig’s, Germany’s Lumiere Bleue parties at I.F.Z. Synthetica is the name of Voin’s current event that is held monthly at Berlin’s Festsaal Kreuzberg. Voin’s DJ sets usually cover the more darker and lighter dreamlike dance orientated side of Synth and beyond. Prepare to be transported.. emotionally. If you know your Italo-disco, you would know George Hysteric. Famed for his vast vinyl collection of ’80s synthpop and disco obscurities, the Melbourne-based DJ has made crowds clamour on the dancefloors across Rotterdam, London, Vienna and beach parties in Italy. Hysteric is also the man behind the Italo-disco label, Mothball Record. It’s themed CD mixes such as “Italo Estate” and the “Lost Treasures of Italo-disco” series, along with the infamous “Hot Girls of Italo-disco” and “Mothball Dance Classics” vinyl EPs (joining with Dutch label Bordello A Parigi) have now become highly sought-after rarities, having acquainted synth lovers with slamming Italo-disco gems that have remained unplayed since the early 1980s.